Why does Verizon have such a mediocre lineup of smartphones? (WIRED) -- Why does the U.S. carrier known for the best network have the worst smartphones? Verizon wins great reviews for its network but not for its phones, which lack the buzz of other devices. Verizon gets plaudits for its coverage and call quality, but consistently loses out to AT&T, T-Mobile and even Sprint when it comes to getting the newest high-end handsets. "They lack the star products that their competitors have," says Avi Greengart, research director, consumer devices for Current Analysis. "They recognize they don't have compelling devices right now but feel they can make up for it with network quality." Case in point: Last week when Motorola co-CEO Sanjay Jha proudly showed off the company's much-talked about first Android phone, the Cliq, he had his arms rather awkwardly around T-Mobile executive Cole Brodman. "We never considered another carrier for this phone," Jha told Wired.com. The Cliq, a coup for T-Mobile, reinforces the new pecking order among wireless carriers. With the iPhone 3G and 3G S, AT&T is now at the top of the pack in its ability to attract new customers based willing to switch to the carrier's network. Sprint and T-Mobile are trying to catch up: Sprint launched the Palm Pre on its network in June and plans to introduce the HTC Hero later this year. And T-Mobile has carved out a niche as an Android-specialist with last year's launch of the first Android phone (the G1), the HTC myTouch earlier this year and now with the Moto Cliq. As for Verizon? The company has the popular but critically panned BlackBerry Storm and the rather staid and Wi-Fi-less BlackBerry Tour. The carrier known for the best network now has the least attractive line up of smart phones. It's a puzzling situation for Verizon. The wireless carrier has had the most customers of any cellular operator in the country since its 2008 acquisition of Alltel, and it's widely regarded as having the largest network coverage area. So the fact that it can't offer its customers better smartphones is a bit of a mystery. Verizon's extremely conservative approach to new handsets, the company's long and rigorous testing procedures and its emphasis on the network rather than the phone has created a portfolio that's a complete buzz kill, say experts. "Verizon doesn't have too many options," says Michael Mace, a former executive with Palm and Apple and currently a principal at strategy and marketing consulting firm called Rubicon Consulting. Not surprisingly, Verizon spokesperson Brenda Raney says the carrier would rather focus on its network than on the gadgets that use it. "Keep in mind that for Verizon Wireless, it isn't so much about the device as it is about the delivery," she says. "We have the nation's largest 3G network so when we offer devices on our network, customers can be assured that they will deliver as promised." It's pretty clear that Verizon didn't deliberately choose to be the boring-but-predictable, safe but unexciting choice. In some ways, it simply got overtaken by the technology. Over the last two years, with the launch of the Apple iPhone, the smartphone business changed rapidly. There are conflicting reports on whether Apple ever offered the iPhone to Verizon; Verizon reportedly turned it down. But with AT&T as the official partner for Apple, the smartphone business took off in a new direction. With its extremely responsive touch screen, sleek, elegant interface, full PC-like browsing experience, the iPhone set a new standard. Customers flocked to AT&T, flooding (and sometimes overloading) its network. Along the way, they left a trail of broken contracts with other carriers. In 2007, when Apple launched the iPhone, 25 percent of iPhone buyers had switched to AT&T from another carrier, according to an estimate from American Technology Research. Meanwhile, as smaller handset makers scrambled to get competitive devices to market, they came up with some unexpectedly good alternatives -- and Verizon lost out there, too. When Palm created the Palm Pre, a device that won praise for its compact hardware design and smart user interface, it offered the device to Sprint. Sprint had been a long-time partner of Palm, sticking with the company through years of increasingly lackluster Treos and the inexpensive but popular Centro, so it's no surprise that Palm rewarded its partner's loyalty. Taiwanese phone maker HTC also grabbed center stage with the first Android phone, the G1. The G1 made its debut on T-Mobile's network, largely because the carrier is more willing to take risks and experiment with new products than others. Verizon may have been lulled into a false sense of security because of its relationship with BlackBerry maker Research In Motion. When RIM created its first touchscreen device, the Storm, it inked an exclusive deal with Verizon. Despite tepid reviews of the Storm, Verizon sold more than a million phones within weeks of its launch. In June, Verizon, along with Sprint, offered the BlackBerry Tour, a Curve-like phone with QWERTY keyboard, 2.4-inch display, GPS and 3G. A well-designed device, the Tour failed to get smartphone enthusiasts excited because it lacked innovative and surprising new features. Also, while Verizon had promised an 'any apps, any device" open network program in 2007, it has reworked the idea to include just non-consumer devices such as routers, not consumer handsets. Instead, the company has focused on creating an app store for developers. Meanwhile, it is trying to win customers through some extremely competitive pricing. Consider the HTC Touch Pro 2 phone, a smartphone running the Windows Mobile operating system and targeted at business users. The device is available after a rebate and on contract with Sprint and T-Mobile for $350. On Verizon it costs $200. Verizon has also been running a 'buy one get one free' promotion for its BlackBerry phones. "Most of Verizon's current line up is below $100," says Greengart. "If you go back a year this was not the case. 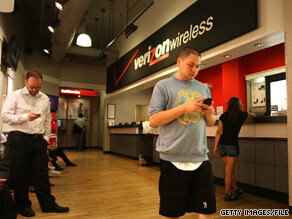 Lately, Verizon has been very aggressive when it comes to pricing." Verizon isn't willing to concede it may have lost ground to other carriers when it comes to attracting the newest phones. "We have a very robust portfolio of smartphones and will continue to add more in coming months," says Raney. "We were the first to bring the BlackBerry Storm to market and just recently introduced the HTC Touch Pro 2." Though the company won't talk about the devices it has planned for later this year, it is sure to introduce a successor to the BlackBerry Storm, a touchscreen phone dubbed the Storm 2. Industry watchers also expect Verizon to bag an upcoming Motorola device for its network. "We feel we will remain competitive," says Raney. But counting on a new BlackBerry device here or a Motorola phone there may not be enough for Verizon. The company will have to take a different road if it wants to get ahead, says Mace. Verizon could work on offering attractive non-phone devices that connect to the network such as netbooks and tablets, he says. "That market is not as developed as smartphones but it would be an interesting opportunity," he says. "It will be logical place for them to go."